At the end of apartheid, under pressure from local and transnational capital and the hegemony of Western-style parliamentary democracy, South Africans felt called upon to normalize their conceptions of economics, politics, and culture in line with these Western models. 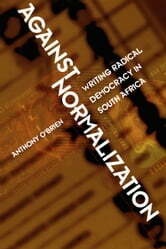 In Against Normalization, however, Anthony O’Brien examines recent South African literature and theoretical debate which take a different line, resisting this neocolonial outcome, and investigating the role of culture in the formation of a more radically democratic society. O’Brien brings together an unusual array of contemporary South African writing: cultural theory and debate, worker poetry, black and white feminist writing, Black Consciousness drama, the letters of exiled writers, and postapartheid fiction and film. Paying subtle attention to well-known figures like Nadine Gordimer, Bessie Head, and Njabulo Ndebele, but also foregrounding less-studied writers like Ingrid de Kok, Nise Malange, Maishe Maponya, and the Zimbabwean Dambudzo Marechera, he reveals in their work the construction of a political aesthetic more radically democratic than the current normalization of nationalism, ballot-box democracy, and liberal humanism in culture could imagine. Juxtaposing his readings of these writers with the theoretical traditions of postcolonial thinkers about race, gender, and nation like Paul Gilroy, bell hooks, and Gayatri Spivak, and with others such as Samuel Beckett and Vaclav Havel, O’Brien adopts a uniquely comparatist and internationalist approach to understanding South African writing and its relationship to the cultural settlement after apartheid. With its appeal to specialists in South African fiction, poetry, history, and politics, to other Africanists, and to those in the fields of colonial, postcolonial, race, and gender studies, Against Normalization will make a significant intervention in the debates about cultural production in the postcolonial areas of global capitalism.